The Solder : Time II is the latest version of Spikenzie Labs' Solder:Time watch kit. This new version is even more hackable than ever. The onboard microcontroller in this model is the very popular ATmega328P used in many of the current versions of Arduino. In fact, you can reprogram your watch using the same Arduino IDE software that you use for a regular Arduino! The Solder:Time II is different from the original Solder:Time in many ways. The display has been upgraded to a set of four 5x7 LED matrix modules. This gives you control of a 7x20 matrix for a total of 140 LEDs! The new LED matrix allows for an amazing amount of information to be displayed; aside from the current time... The date, month, words, scrolling messages, graphics, special characters ... the possibilities are endless. It also comes with a piezo buzzer for the alarm function, but you can use it to add sounds to your custom programming and games. Much like the original Solder:Time, the Solder:Time II comes to you as a PTH kit. There are SMD parts already soldered to the board when you get it, so don't worry about trying to solder those tiny lead-spacings. 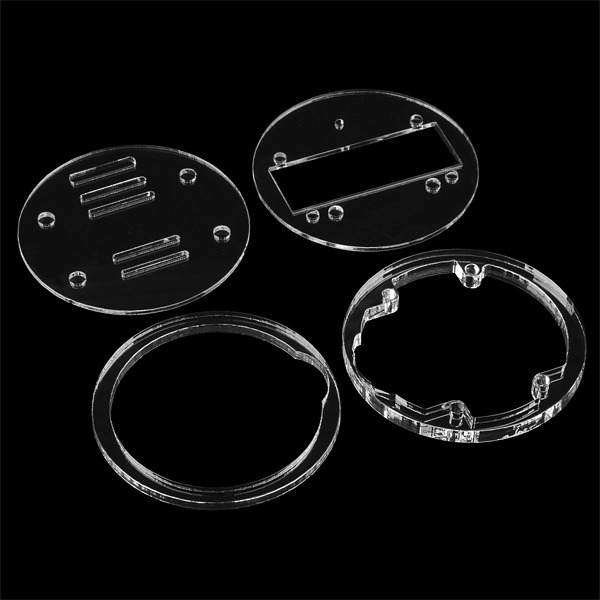 The body of the watch is still a "stacked acrylic" construction, but some changes have been made to make the watch sturdier and easier to assemble. What is battery life, assuming you don't have the LED on all the time? Its works better with a lithum accu, like LIR2032 or PD2048. The Voltage is more high - 3.6V and not 2.95V. I picked up one of these kits at Maker Faire in New York this last weekend. This one went together a lot easier than the Big Time kit that I built earlier. They've fixed the few problems I was having with the first version. I'm very pleased. Does the piezo buzzer on this allow me to play tunes, or just output a single tone? In the firmware it's used to give different beep tones when adjusting a value up vs down. The image that shows the time (with the LEDs lit up) is photoshoped, isn't it? I'd say yes, but I think it's because the display wouldn't photograph well. a tiny watch-sized 7x20 led matrix with a DS1337s rtc. Sweet creator of the internet this is amazing! 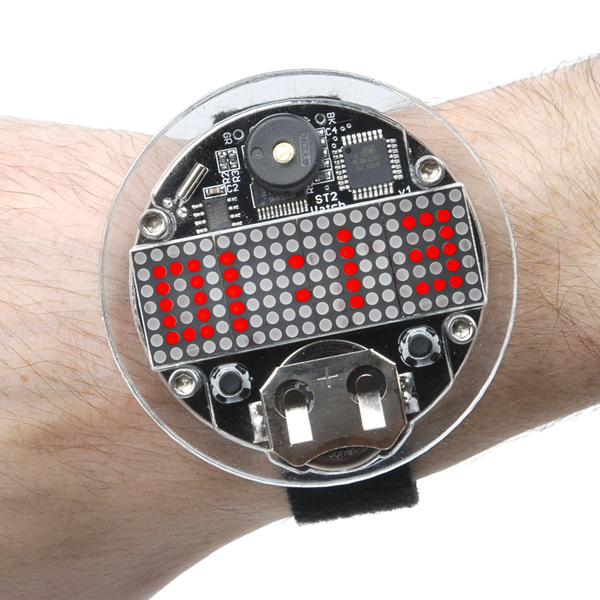 this looks like the perfect entry for anybody that wants to program their own graphical watch. i can definitly see myself getting one of these someday. damn, this would have been perfect. I want to write my own firmware for a watch, and this hardware looks like what I want, but without the schematic or at least the list of what's in there, I wouldn't buy it. 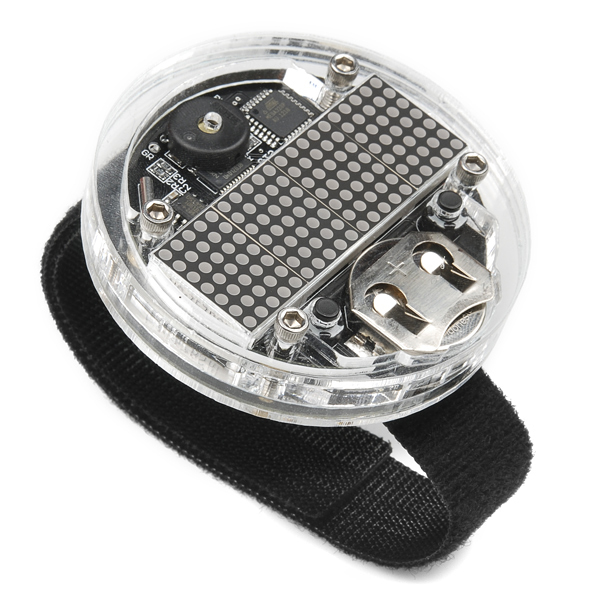 I am looking for a watch band to monitor accelerometer/gryoscope data. My prototype currently employs a proMini, 6DOF and Xbee. 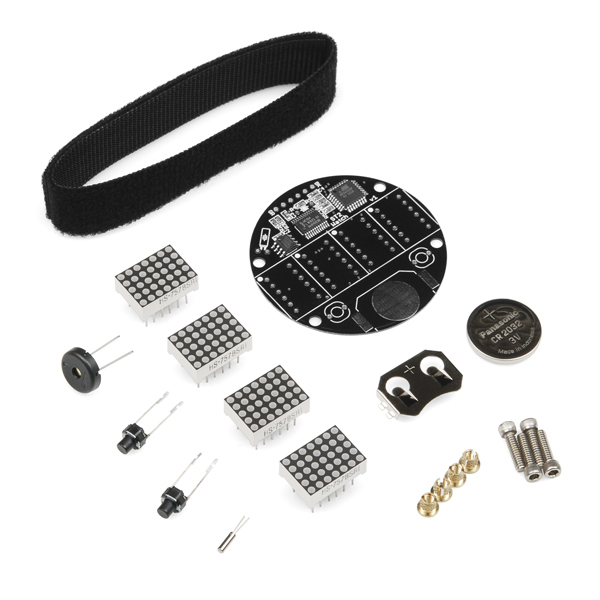 Is there room for one of your 6DOF breakout boards and/or Xbee? Is the i2c available on the board in this kit from the 328P? If not, can I purchase the watch enclosure separately? I bought it as a gift. Therefore, I was expecting a slightly nicer package. Instead, received a plastic baggie with no instructions or packaging whatsoever. As I wanted to give it to someone who hasn't heard of your product, I had to dig information on your website myself, look up instructions on how to assemble (which are not even available in nice downloadable form, by the way) and print it myself. Please consider that your product is promoted on many sources as cool gift idea, so maybe try to make it more gift-friendly. He hasn't assembled it yet so can't comment on product quality yet. I have probably a hundred watches, and this one is a favorite. Lots of nice comments from people I meet. I enjoyed putting this kit together, it worked the first time and was a simple, fun project. The instructions are pretty good, fairly clear and in color. There aren't any major discrepancies or spots where things weren't clear. The wrist strap is pretty lame, it's why I don't currently bother wearing this thing, and I'm thinking about ways to make a better strap out of leather.